It was one for the record books in Waverly and Tioga this football season. Both squads made it to the state semi-finals, the furthest in school history. Tioga's Cody Bennett is The Daily and Sunday Review All-Region Player of the Year after his eye-popping rushing numbers in the playoffs. The Tioga coaching staff led by Nick Aiello is the Coaching Staff of the year. Waverly quarterback Zach Cooney is the Offensive Player of the Year with his strong passing numbers that included over 25 touchdowns through the air this season. Fellow Wolverine Jon Duval is the Defensive Player of the Year as he anchored the tough Waverly squad. Towanda's Trey Sites is the Newcomer of the Year for helping to lead the Black Knights to their third straight NTL Large School title in his first year at quarterback. North Penn's Nick Harer is the Lineman of the Year. He anchored the offensive and defensive lines for a team that won the Eastern Conference title. For First Team offense Cooney is the quarterback with Bennett and North Penn's Skye Stiner in the backfield. Tioga's Tyler Spires is the First Team fullback. The wide receivers are Waverly's Ryan Hewitt and Athens' Ray McDougan with Troy's Zach Root the tight end. 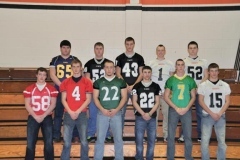 Fellow Trojan Lucas Havens is the versatility pick while Towanda's Zack Ripic is the utility selection. The offensive line consists of Harer, Tioga's Derek Jorgensen, Waverly's Derek Bowman, Athens' Jon Canfield and Towanda's Dave Canfield. The kicker is Athens' Troy Stivason. For First Team defense the tackles are Duval and Canton's Wes Campbell while Towanda's Joe Daniello and Sayre's Ryan Myers are the ends. The linebackers are Tioga's Nick Talcott, Waverly's Dylan Gutierrez, Towanda's Mason Roof, Troy's Tanner Bulkley and Sayre's Alex Lyons. The defensive backs are Towanda's Jordan Dawsey, Waverly's Jeff Mastrantuono and Athens duo of Nick Carl and Adam McCauley. The versatility pick for defense is Wyalusing's Dan Frankenfield while North Penn's Marquis Delgado is the utility selection. Canton's Ben Pepper is the punter. The Second Team offense is headlined by Sites at quarterback while the running backs are Athens' Casey Shiposh and Sayre's Jesse Dagutis. Wellsboro's Thomas Johnston is the fullback. The wide receivers are Athens' Brad Sampson and Wyalusing's Chris McDonald with Athens' Curt Moore the tight end. Canton's Jordan Campbell is the versatility pick while Towanda's Casey Huff is the utility. The offensive line is Tioga's Carter Jackson, North Penn's Nathan Stettler, Wyalusing's Anthony Benninger, Athens' Tim Keener and Towanda's Ed Fetterman. The kicker is Troy's Josh MacClaren. The Second Team defense is Troy's Delbert Lewis and Towanda's Garrett Dinelli at the defensive tackle spots with Tioga's Adam Strong and Wyalusing's Clayton Force on the ends. The linebackers are Towanda's Jevin Vanderpool, Canton's Scott Rockwell, Sayre's Al Bodolus and Waverly's Mark Connor. The defensive backs are Waverly's Trevor Nocchi, Wyalusing's Joe Champluvier, Wellsboro's Ben Shaw and Sayre's Mike Bostwick. The versatility selection is Athens' Justin Schlosser while the punter is Wyalusing's Tyler Fenton. The Third Team offense is North Penn's Jason DeHaven at quarterback, Tioga's Zach Williams at fullback and Waverly's Nick Puusalu and CV's Ryan Freeman at the running back spots. The wide receivers are Waverly's Austin Bostwick and Canton's Ryan Kutz with Sayre's Nick Bostwick the tight end. Troy's Jed Wright is versatility while Athens' Tyler Birdsall is the utility selection. The offensive line is Waverly's Darren Tryon, Canton's Conner Route, Sayre's Gabe Nobles, CV's Jacob Gruver and North Penn's Chris Makley. The kicker is Canton's Brian Jannone. The Third Team defense has Gabe Gates of Waverly and David Mendola of Sayre in the tackle position while the ends are Waverly's Chris Raupers and Canton's Tim Bassett. The linebackers are Tioga's Jake Howland, Wellsboro's Chase Barnes, North Penn's Sam Bohnert and Waverly's Jon Puusalu. The defensive backs are North Penn's Taylor Hillson, Tioga's Ryan Verguson, Wyalusing's Aaron Johnson and Wellsboro's Michael Pietropola. The versatility selection is Canton's Wes Moore and the punter is North Penn's Jimmy Price. WR: Brad Sampson, Athens - Chris McDonald, Wyal. DE: Adam Strong, Tioga - Clayton Force, Wyal.